The thyroid hormones, which control your metabolism, covers two hormones:T3 and T4. T3 is more active than T4, which is secreted from the thyroid gland and converted into T3. 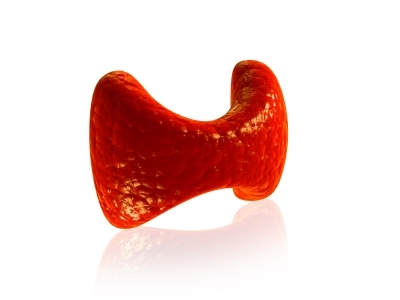 Thyroid hormones contain iodine, so iodine absorption is important in thyroid function. Thyroid hormones’ main effect is increasing the basal metabolic rate (BMR) – this is the rate of calories your body burns at rest. The higher the BMR the more energy you will use doing normal day to day activities. This is also linked to your bodies muscle mass. The higher the muscle mass in your body, the more calories your body will use to sustain the muscles. Fat cells don’t require as much sustenance. So muscle is more metabolically active. Thyroid hormone regulates tissue growth and development and maintains blood pressure. The anterior pituitary gland gives off thyroid stimulating hormone (TSH), and this causes the thyroid gland to make T4. If you have a blood test for thyroid function, you will see TSH, which is the amount of substance working on the thyroid gland to make thyroid hormone. TSH is cyclical and tends to be higher just before we go to sleep and lower during the day. Having the correct level of thyroid hormone helps the body to maintain a healthy metabolic rate and heat production. When the body creates heat, calories are burnt. Thyroid levels should be balanced for optimum function. When the thyroid gland is over active or under active, both can cause problems in the body. The ‘normal’ range for thyroid hormone levels is wide. If your thyroid is on the low side or on the high side of ‘normal’, you may still experience some of the symptoms of hyper or hypothyroidism. Hypothyroidism means the thyroid gland is not releasing enough thyroid hormone, this could be due to damage to the thyroid or an iodine deficiency. People who suffer with hypothyroidism tend to be cold, overweight and tired. What will managing your thyroid hormone levels do for you? Limit cruciferous vegetables to 150g per day. They may block the uptake of iodine in the digestive tract if they are eaten in large quantities. Watch your gluten intake, gluten can be abrasive to the gut and interfere with nutrient absorption. If you think you are intolerant to gluten, try a 6 week elimination diet. If you do tolerate gluten, it’s still a good idea to reduce your intake. Reduce sugary foods and empty calories. Everything we eat should contain nutrients. When your metabolism is running slower, sugary foods can lead to weight gain. Avoid processed foods as much as possible. These tend to be loaded with sodium, although sodium is essential for our bodies to function, too much sodium can disrupt the thyroid hormones. Reduce caffeine intake, caffeine may interfere with thyroid hormone production. Check the labels of things you drink to make sure you know what you are putting into your body. Reduce alcohol intake as it has a big impact on thyroid hormones. Increase iodine intake from shellfish, nuts, seeds and sea food. If you suspect that you have low thyroid hormone levels, or need some help with an elimination diet, get in touch to set up a consultation where a personalised plan can be created.